MPOD testing provides a risk assessment for macular degeneration and other vision issues by measuring the amount of pigment in the macula. Macular pigment improves visual acuity, contrast sensitivity, light sensitivity and glare recovery and a lack of pigment in the macula is a risk factor for macular degeneration. Studies show that 78% of the US population has less than optimal macular pigment. Healthy macular pigment acts as “internal sunglasses” to protect against harmful blue light that enters the eye and negatively impacts the visual cells responsible for central and peripheral vision. Significant increases of pigment can be achieved through nutritional intake and supplements containing Zeaxanthin and Lutein. EyePromise® Restore offers a full suite of essential nutrients to preserve and support vision for people concerned with age-related eye health. If you’ve noticed changes in your eyesight during the last few years, you’re certainly not alone. 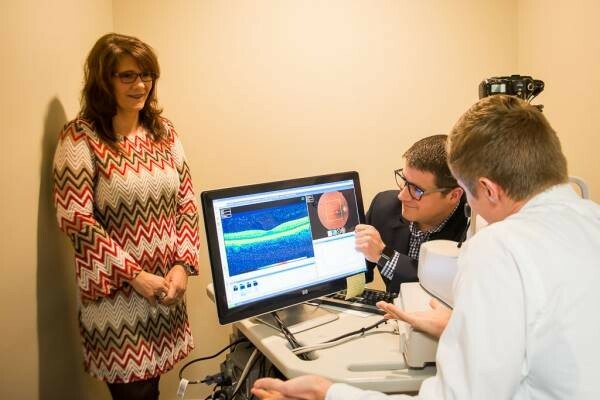 As we get older, our vision becomes more vulnerable to age-related eye health issues. To learn more or to purchase Restore, please click here. If you have appropriate goals and there are no contraindications for the procedure, we will recommend a pre-operative evaluation with a local surgeon to determine suitability for refractive surgery. If the decision is made to proceed with surgery, your post-operative management will be provided in our office. This includes multiple visits over a period of time to include medical evaluation and management of your vision and ocular healing.